Horse Sense with Muriel Mitchell | Muriel obtained her horse sense knowledge growing up as a child, working and riding horses on the family farm. 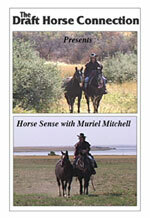 Horse Sense gives you a chance to observe, and learn Muriel’s techniques for reading and caring for horses. Muriel’s natural horsewoman skills shine as she demonstrates patience and understanding of a horse’s capabilities. Spend a day with Muriel as she saddles her quarter horse, Comanche, and ponies her quarter horse, Special for a trail ride around beautiful, scenic Diefenbaker Lake at Elbow, Saskatchewan. DVD only, $29.95 plus $4.95 shipping.